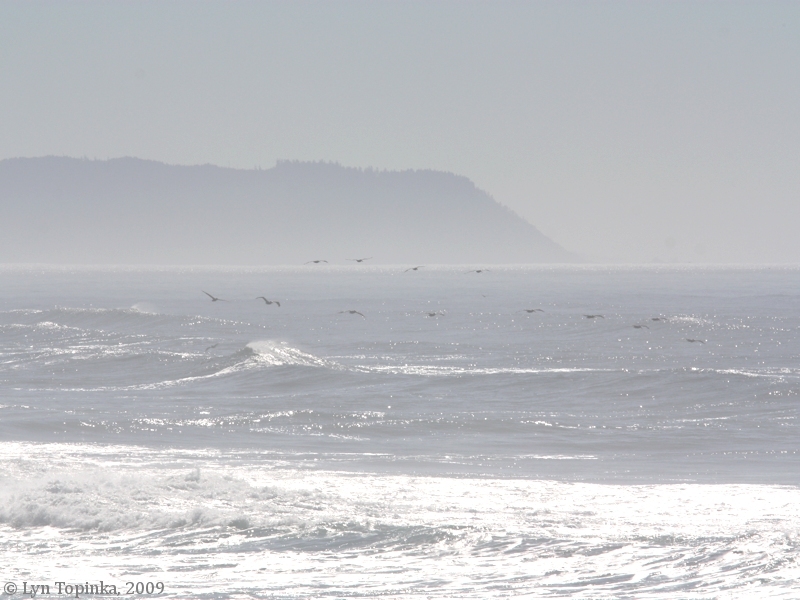 Click image to enlarge Pacific Ocean and Tillamook Head with Brown Pelicans, Oregon. View from the South Jetty, Clatsop Spit. Image taken September 27, 2009. Tillamook Head is a large Oregon headland extending into the Pacific, south of Clatsop Beach and Clatsop Spit, and can be seen from as far north as Cape Disappointment, Washington. 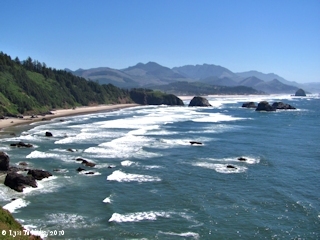 The Oregon community of Seaside lies just north of the headland and Cannon Beach lies south of the headland. Captain Clark passed, climbed, and spent the night near the top of Tillamook Head on January 7-8, 1806, while on his way to Cannon Beach to see a dead whale. The next morning Clark proceeded to the top and exclaimed over the view, giving Tillamook Head it's often-used named "Clark's Point of View". Point Adams was thought to have been discovered by Captain Bruno Heceta on August 17, 1775, while he was off the North American coast. Some historians however, even as early as 1889, question whether Heceta did not see Point Adams, but instead saw Tillamook Head. The two capes which I name in my plan, Cape San Roque and Cape Frondoso, lie in the angle of 10 degrees of the third quadrant. They are both faced with red earth and are of little elevation. "... On August 17, 1775, he [Heceta] was off the mouth of the river, which he supposed to be a great bay, but he was so far distant that he noted only the Cape, on the north, and Tillamook Head on the south. 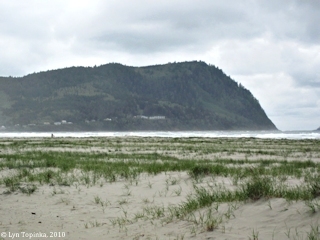 ..."
Click image to enlarge Tillamook Head from the beach at Seaside, Oregon. Image taken May 2, 2010. 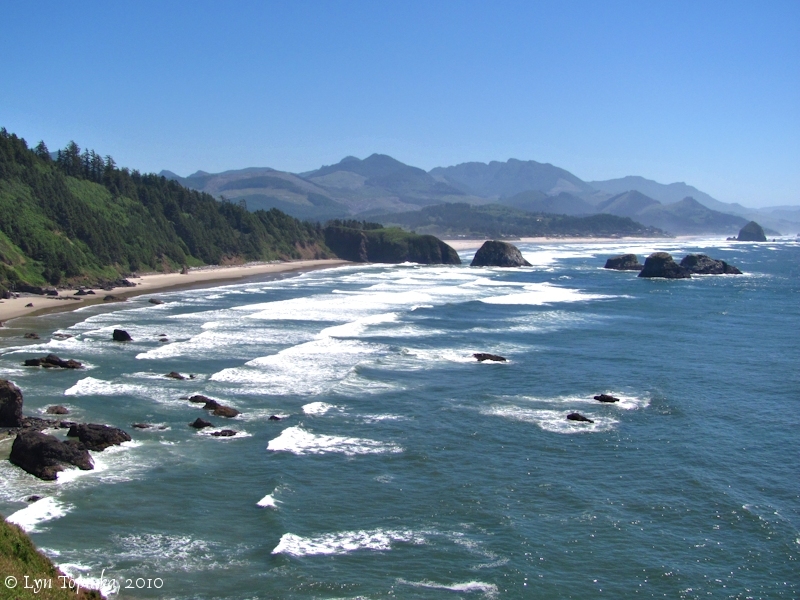 Today the entire tip of Tillamook Head is Ecola State Park, with one of the southern points being named Ecola Point. 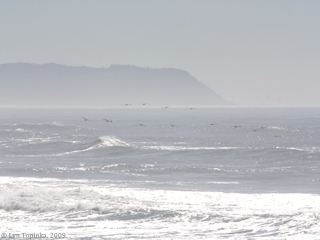 In 2004 Ecola State Park became part of the Lewis and Clark National Park, a grouping of National and State parks in Washington and Oregon relating to Lewis and Clark. Click image to enlarge View of the Oregon coastline looking at Crescent Beach and Chapman Point, as seen from Ecola Point, Ecola State Park, Oregon. Note Haystack Rock on far right. Image taken July 14, 2010. "... I have a view of the Coast for an emence distance to the S. E. by S. the nitches and points of high land which forms this Corse for a long ways aded to the inoumerable rocks of emence Sise out at a great distance from the Shore and against which the Seas brak with great force gives this Coast a most romantic appearance ..."
Fifteen million years ago large fissure eruptions occurred near Lewiston, Idaho, sending massive volumes of lava across eastern Washington and down the early Columbia River valley. These lava flows created layers upon layers of basalt reaching hundreds of feet in thickness. Collectively these lava flows are known as the Columbia River Basalts. Some of these flows poured into the Pacific Ocean and spread out through the soft marine sediments for dozens of miles. In some spots (such as Haystack Rock), these flows re-erupted through thousands of feet of mud onto the sea floor, essentially having their own eruptive centers. These lavas then cooled to become solid basalt. Millions of years later as the Coast Range lifted, so did these massive flows. Erosion took over creating such headlands as Tillamook Head and sea stacks such as Haystack Rock. 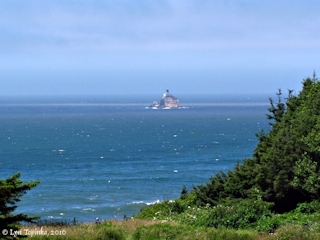 The Tillamook Rock Lighthouse, also known as "Tilly" and "Terrible Tilly", sits on a large rock off Tillamook Head. The lighthouse operated from 1881 to 1957. According to the "Oregon Encyclopedia" (2018, Oregon Historical Society), the lighthouse was originally slated for Tillamook Head, "but officials determined that the south-facing landform would not provide good visibility for mariners seeking the bar." Tillamook Head was later donated by its private owners to the state and became Ecola State Park. Tillamook Rock is an acre in size, rises nearly 100 feet from the sea, and lies 1.2 miles due west from Tillamook Head and 20 miles south of the mouth of the Columbia River. The lighthouse tower stands 133 feet above sea level. The U.S. Coast Guard closed the Tillamook Lighthouse in 1957. It had become the most expensive lighthouse in the country to maintain but had been made obsolete by "modern radar and communications technologies." Declared surplus, Tillmook Rock was sold several times. It is now part of the Oregon Island National Wildlife Refuge and in 1981 was listed on the National Register of Historic Places (Event, Architecture/Engineering #81000480). Click image to enlarge Tillamook Rock Lighthouse, as seen from Ecola Point, Ecola State Park, Oregon. Image taken July 14, 2010. "Tillamook Head WWII Radar Site (1943-1944, 1948-1950) - A World War II U.S. Army Signal Corps Radar Site established in 1943 as a part of the Aircraft Warning Service (AWS). Used to provide early warning and direction of intercepts of approaching enemy aircraft. Located by Tillamook Head, south of Seaside in Clatsop County, Oregon. Deactivated in 1944 reactivated in 1948 and declared surplus in 1950. Also known as Station J-23. This radar site was established in 1943 during World War II as a part of a chain of some 65 radar stations along the West Coast of the United States and Canada. These secret radar sites were built to provide early warning and interception of approaching enemy aircraft and ships but also served to assist friendly aircraft that were lost or had in-flight emergencies. This radar network was in addition to a network of search and fire control radars established at each of the West Coast harbor defenses. ..."
Operations Site - Now part of Ecola State Park property, The shell of the underground operations building has both hillside entrances blocked by heavy steel doors. Above ground, the air intake and exhaust vents are visible with the most prominent being the triple intake vents for the three generator radiators. Also visible are the concrete antenna support piers on the west side of the building. Cantonment Site - Now part of Ecola State Park property, no visible remains." beares S. 20° W. about <40> [WC? : 25] miles, point adams [Point Adams, Oregon] is verry low and is Situated within the direction between those two high points of land, the water appears verry Shole from off the mouth of the river for a great distance, and I cannot assertain the direction of the deepst Chanel, the Indians point nearest the opposit Side. the waves appear to brake with tremendious force in every direction quite across a large Sand bar lies within the mouth nearest to point Adams [Point Adams] which is nearly covered at high tide. I suped on brant this evening with a little pounded fish. Some rain in the after part of the night. men appear much Satisfied with their trip beholding with estonishment the high waves dashing against the rocks & this emence ocian.